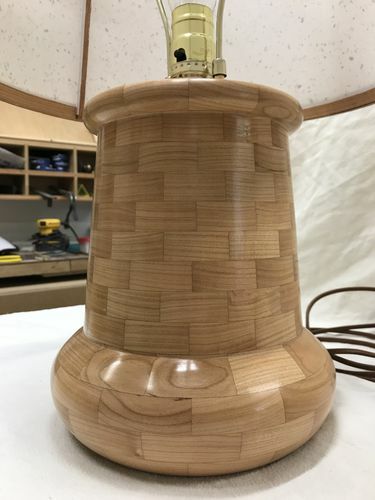 Segmented cherry lamp base as part of a larger project (posted separately as a project to talk about the shade). 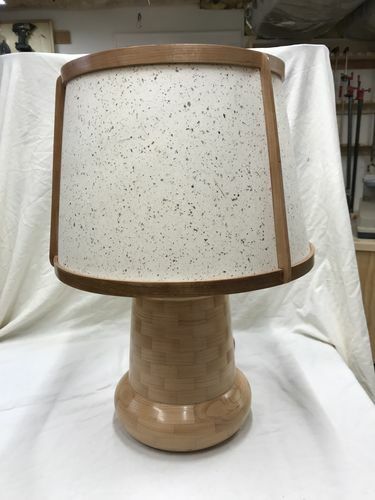 It was nice to not have to hollow this thing and to concentrate on the exterior form and finish. The project went well overall. I did a segmented top, and the true center was difficult to locate and the hole for the pipe / conduit ended up a bit off-center. I really needed a cone live center, as my small cup + point center didn’t center well in the hole. I now have a cone live center :). Also, despite sanding all the segmented rings flat and using my glue up press, I ended up with a pretty significant gap between two of the rings. I filled them with CA and sawdust, and it looks ok, but I’m still not sure how I got that gap. I used both a bowl scraper and a negative rake cutter on an Easy Wood Tools rougher for finishing cuts. I was able to achieve my best surface before sanding to-date. I don’t know how much of the effectiveness of the negative rake cutter was its geometry and how much was it being a fresh, sharp cutter, but it was definitely easier to take whisper-light cuts on a finishing pass. Sanded to 400. Shellawax finish.